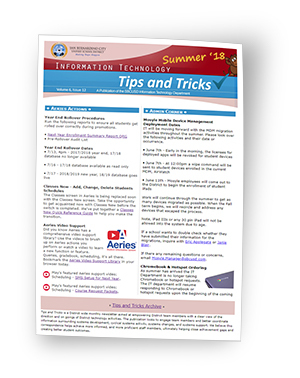 Tips and Tricks is a District wide monthly newsletter aimed at empowering District team members with a clear view of the direction and on goings of District technology activities. The publication looks to engage team members and better coordinate information surrounding systems development, systems changes, cyclical systems activity, and systems support. We believe this correspondence helps achieve more informed, and more proficient staff members, ultimately helping close achievement gaps and creating better student outcomes. • One Aeries, One Web Address! • Problems Sharing Files in Google Drive? • Where are my Computer Files? • Bestnet - Where are my Paystubs?